It was a sunny Southern California day in Hemet, California. Lynnea White was driving South on Fairview Road in her blue Honda Accord. Fairview Road is a major two lane road with no traffic lights or stop signs in the area where she was driving. Ahead of Lynnea was a small street, named Olive Street, which crossed Fairview Avenue. The intersection of Olive and Fairview does not have any traffic lights. Olive Street has only stop signs where it crosses Fairview Road. Driving east on Olive Avenue in his red Ford was Mr. Harry Bishop. Mr. Bishop lives on Olive Street, on the east side of Fairview, and was headed home. Mr. Bishop reached the intersection of Olive and Fairview and stopped at the stop sign for a few seconds. He said he then saw a truck driving south on Fairview which was turning right onto Olive. He said that the truck blocked his view of vehicles coming south on Fairview. Just before Lynnea’s car reached the intersection Mr. Bishop pulled out onto Fairview. He then saw Lynnea’s car so he stopped in the middle of the lane Lynnea was driving in on Fairview, directly in front of Lynnea’s car. Lynnea immediately applied her brakes in an effort to avoid Mr. Bishop’s car. Lynnea was unable to stop in time and her car crashed into the driver’s side door of Mr. Bishop’s car. The police came but declined to write a report. There were no witnesses to the accident other than Lynnea and Mr. Bishop. Mr. Bishop later denied he was at fault. He said that he had driven his car only a few feet away from the stop sign on Olive when he stopped and said that he was not fully into the intersection when his car was hit by Lynnea’s. Mr. Bishop said that Lynnea turned to the right and crashed into his car. He said that if Lynnea had continued driving straight in her lane on Fairview the accident would not have happened and that Lynnea was at fault. Lynnea was seriously injured in the crash and Mr. Burns filed a lawsuit on her behalf against Mr. Bishop. Mr. Burns then used the two attached post -accident car damage photos and crash animation videos and to win the case for Lynnea. When looking at the post-accident photos of Lynnea’s blue Honda Accord, Mr. Burns saw that there was deep vertical gouge in the front on Lynnea’s car, just between her left front fender and license plate. He realized that this was where Lynnea’s car had hit the left front tire and driver’s door of Mr. Bishop’s red Ford. In addition, the photos of Mr. Bishop’s car showed a gouge at the base of his driver’s door where Lynnea’s license plate had hit. 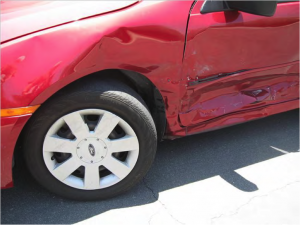 All this evidence showed that Lynnea’s impact on Mr. Bishop’s car was relatively straight on with no turning by Lynnea as alleged by Mr. Bishop. Although there was some damage to the left front of Lynnea’s car there was also damage all across the front of her car. If Lynnea had been in a right turn there should have been more damage to her left front fender and left front tire area. Mr. Burns then had an accident reconstruction expert create animations of the collision. Here is what the animation videos showed. Video animation # 1 showed a collision which would result in general uniform damage all across the front of Lynnea’s car. As can be seen in video #1, the car pulling away from the stop sign pulled all the way into the intersection before stopping directly in front of Lynnea, making it impossible for her to avoid hitting his car. This video was consistent with the damages shown in the post-accident photos of the cars. Video animation # 2 shows a collision as described by Mr. Bishop. This video showed that, for Lynnea to have made a turn to the right and still have the damage as shown in the post collision photos, Lynnea would have had to make a right turn followed by a left turn before impact. That is the only way Lynnea’s car could have the generally uniform damage all across the front of her car. The video demonstrated that Mr. Bishop’s story was highly unlikely due to the fact that people don’t usually drive out of their way to run into other cars. Mr. Burns then advised the insurance defense attorneys of his findings about the uniform damage to the front of Lynnea’s car and showed them the post-accident photos and video animations. Shortly thereafter, the insurance company offered to pay Lynnea the entire amount of Mr. Bishop’s $100,000 insurance policy. Lynnea accepted the settlement offer and the case was successfully concluded. The moral of the story is that, even when other drivers change their story as to who was at fault, the science of accident reconstruction and crash animation can be used to bring out the truth. A good accident reconstruction expert and good lawyer should be able to help you if you are ever caught in a situation like this. 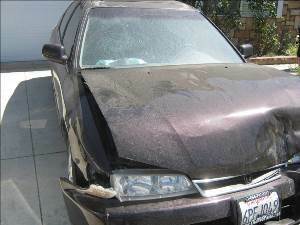 If you have been in an accident and were injured, please feel free to contact attorney John P. Burns at 949-496-7000. The first call is always free and we will be sure to answer any questions you have. You may also e mail Mr. Burns at john@johnburnslaw.com and he will be glad to help you.